Whistle Buoy Wreck is a bit further out from Key Largo than a lot of the other wrecks. 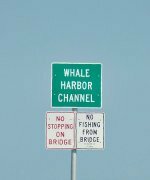 However, this means that planned diving trips will experience a lower volume of traffic than is typical at many of the other Florida Keys diving sites. This is a good thing as this is a rather good Key Largo diving site that is well worth a dive trip when you have the time. There are some particularly outstanding features that make this a good Key Largo diving choice. The exceptional clarity of the crystal clear water is raved about. The wreck is also known for her abundance of fish, and there also happens to be some interesting artifacts you'll come across in her debris field. Overall, this makes the Whistle Buoy Wreck one of the more interesting Florida Keys diving sites you'll want to include on diving vacation in the Florida Keys. This wreck is also referred to as Harris Freighter. Her build is very typical of what you would expect a freighter to be, and she sits at about 220 feet in depth, near Pacific Reef. Since you're already quite a distance from Key Largo FL, if you've got the time, this becomes a good first or second dive, in conjunction with the technical wreck dive, the Ocean Freeze. The ship itself is about 170 feet long and has become a very good example of what an artificial reef is supposed to become. Numerous tropical fish, larger pelagic species and a variety of game fish inhabit the area. Coral, spiny oysters, and ocean sponge also encrust sections of her structure. This vessel was intentionally sunk, so it's likely that the scuttling charges were responsible for a section of the bow being severed from the stern. This break in the ship occurs about 50 feet from where the wheelhouse once stood. The missing piece of bow, lies about 200 feet amid the debris field. At the stern, which is about 100 feet long, you'll discover the freighter's wheelhouse. This has fallen and is now crumpled backwards, again perhaps due to the scuttling charge. There's also some rather odd looking concrete that's in the wheelhouse area, and in some of the compartments. When you encounter these artifacts, perhaps you'll be the one to finally determine exactly what they are. There's been considerable controversy over whether they're some form of molding, or a different type of ballast used in the ship. The Whistle Buoy Wreck is also interesting in that the debris field surrounding the ship is rather large. Some of the pieces are very substantial and you'll notice that some are almost buried, or are partially covered by the ocean floor's sand. The debris field is most likely a result of several things, first of which would be the explosion. The scuttling charge is responsible for sending out a spray pattern of debris as the ship broke up. In fact you'll discover two very large square based towers about 45 feet in length, lying on their sides. However, some of the debris is due to the fact that this wreck has become home to an abundant quantity of fish. When you have fish, you have fishermen, and this wreck site has become a rather hot spot for Florida Keys fishing trips. The tools of their trade lie scattered all over the area. 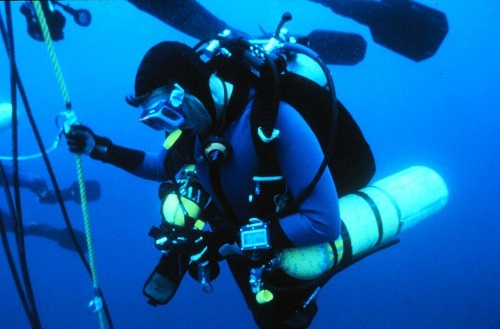 Scuba divers need to be particularly cautious so they don't become entangled or snagged by wayward hooks, lines, netting and other pieces of fishing equipment debris. As a technical diver, you'll find that the water at these depths can be somewhat chilly, but it's not the hardest dive you'll make when scuba diving Florida Keys. The Whistle Buoy Wreck will however be one of your quieter dives, and there's one other major perk you'll enjoy - the water's clarity. You'll be surprised by how far you'll actually see, as you explore this well forming artificial reef.